Sept. 25, 2018 | LITTLE ROCK — The University of Arkansas for Medical Sciences (UAMS), seeking to build on last year’s success, will hold its second annual Day of Giving on Oct. 2 and aims to raise $400,000 in 24 hours through donations to its foundation. Last year’s campaign, UAMS’ largest single-day philanthropic effort in its history, raised more than $356,000 to support programs across the institution. More than 1 million patients each year are seen by UAMS faculty at its main campus, regional campuses, the Central Arkansas Veterans Healthcare System and Arkansas Children’s Hospital. UAMS graduates nearly 1,000 doctors, nurses, pharmacists and medical professionals each year, the majority of whom stay in Arkansas to practice. State appropriations are only about 6 percent of UAMS’ $1.5 billion annual budget. Patient care revenue makes up the lion’s share, or 75 percent. As state appropriations remain flat from year to year, and needs continue to grow, UAMS seeks additional philanthropic support from around the state. The UAMS Day of Giving will run 24 hours, beginning at 6 a.m., Oct. 2, and ending at 6 a.m. Oct. 3. Patterson will kick off the day’s events by making the first donation. All funds raised will support the various programs, funds, colleges or institutes chosen by the donor. 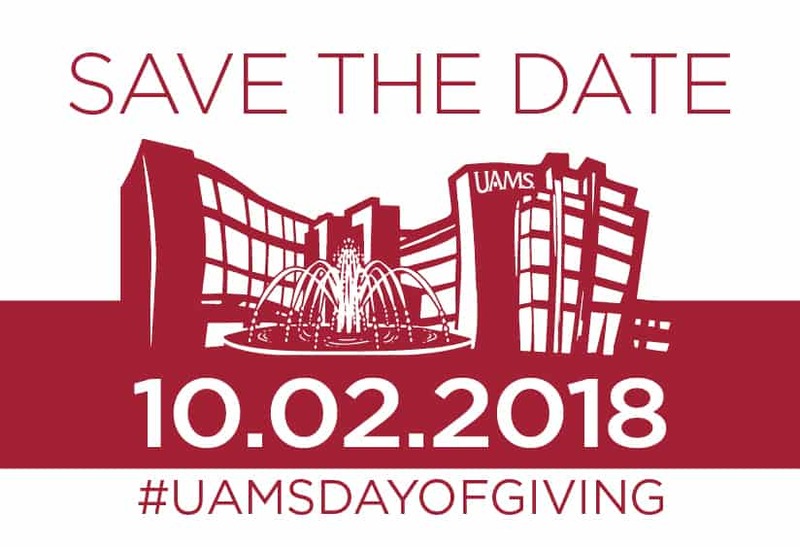 Gifts are tax deductible and can be made online at dayofgiving.UAMS.edu, on the phone during normal business hours at 501-686-8200, or in person at the offices of Institutional Advancement at UAMS. A gift of any amount to any program or fund of the donor’s choice will count toward the $400,000 goal. Throughout the day, supporters of the initiative can share stories on social media about how UAMS has made a difference for them using the hashtag #UAMSDayofGiving.